How to create a menu from start to finish! 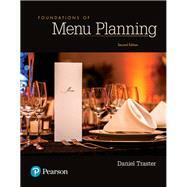 Foundations of Menu Planning guides readers through the menu planning process in the same order in which a professional menu planner conducts the process. Menus are marketing mechanisms, cost control tools, and critical communication devices for successful food service operations. Beginning with identifying and defining a target market, the book progresses through understanding various menu styles, creating beverage menus, costing recipes, determining menu prices, and analyzing and engineering an existing menu. A unique chapter on unwritten menus, a capstone project for creating an original menu, and a concluding look at the menu-first approach to building a successful foodservice operation reinforce the book’s reputation as the most comprehensive resource of its kind on the market. The Second Edition incorporates a wide range of new information including: strategies for incorporating nutrition into menus based on the Dietary Guidelines for Americans 2015-2020 and shifts in menu pricing strategies from the traditional table d’hote to the more contemporary prix fixe with supplemental charges. Also included are trends in menu planning, from small plates and signature cocktails, to online menu design and layout and menu engineering to maximize profitability. Daniel Traster CCP, is a freelance writer, culinary consultant, and author of three books: Welcome to Culinary School: A Culinary Student Survival Guide (2010, 2016), Foundations of Cost Control (2013), and Foundations of Menu Planning (2013), all published by Pearson Education. Former Dean of Culinary Arts and Hospitality Management at Stratford University and former Academic Director for the Art Institute of Washington, Traster had eight years of experience in formal culinary arts education before pursuing culinary education consulting. Prior to his time in education, Chef Traster worked at the Four Seasons Hotel in Philadelphia, and at Provence Restaurant, Occasions Caterers, and American University all in Washington, DC. Traster has a BA in English and Theater from Yale University, an AOS in Culinary Arts from the Culinary Institute of America, and an MS in Adult Learning and Human Resource Development from Virginia Tech.